This one has been on the agenda for a long, long time, but I could never quite get it right. 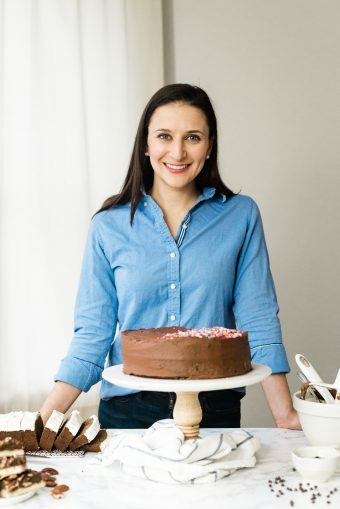 For the longest time, I tried to make it like the homemade (sugar free) dark chocolate – which is to say, dairy free, made with coconut oil, sweetener and a flavor, but the absorbent, bonding quality that cocoa powder served as in the dark chocolate was more important than I anticipated. When it came time to figure out sugar free white chocolate, I tried to combine coconut oil and cocoa butter as the base (cocoa butter is the base of all white chocolate; white chocolate doesn’t actually include any chocolate), but that produced a really hard brick of fat that would probably have served very well as some kind of moisturizer. But not as food. The secret ingredient, as it turns out, is milk powder. My sincerest apologies to those with a lactose allergy and/or my vegan readers, but I promise you I did my absolute best to find a way to make this without either powdered (cane) sugar or milk powder. It turns out it is one or the other. So milk powder it was. It’s a bit of an unusual ingredient, but it is worth tracking down. I used Now Foods organic nonfat milk powder, which you can get online. You can probably use full fat milk powder instead, if you can find it. I know I’m not alone when I complain that most commercial white chocolate is sickeningly sweet, so I made a point to use the bare minimum of sweetener in this one. Feel free to reduce the sweetener, but don’t increase the granulated sweetener – I can’t explain it precisely, but the fat will only suspend so much granulated sweetener and 2-3 Tablespoons seems to be the limit – so if you want it sweeter, you may want to use drops of liquid stevia to sweeten the chocolate instead. Because this chocolate is so pure, and contains no emulsifiers or gums to hold its shape, you have to freeze it before you bake with it. Take it out of the freezer immediately before folding it into the batter, then pop whatever you’re baking in the oven immediately. Freezing it gives the chocolate a snowball’s chance in hell (literally) of holding its shape during the baking process, because it will take longer to heat up to its melting point (ideally, it will take longer to get to its melting point than it will be in the oven, preventing it from liquefying and absorbing into the batter). Plus, if you want to drizzle some white chocolate on top of a cookie, or give a thoughtful homemade gift to your white chocolate-loving BAE (<— non-millennial translation: significant other), or for yourself (totally acceptable BAE), this is the stuff! Put the melted coconut oil and cocoa butter in a large mixing bowl. Whisk in the milk powder and sweetener until smooth and well combined. Whisk in the vanilla extract and the salt. Transfer to the refrigerator to chill and set. If you want this to be dairy free, you can use coconut milk powder instead of dry milk powder. If you can't get powdered sweetener, you can use granulated. 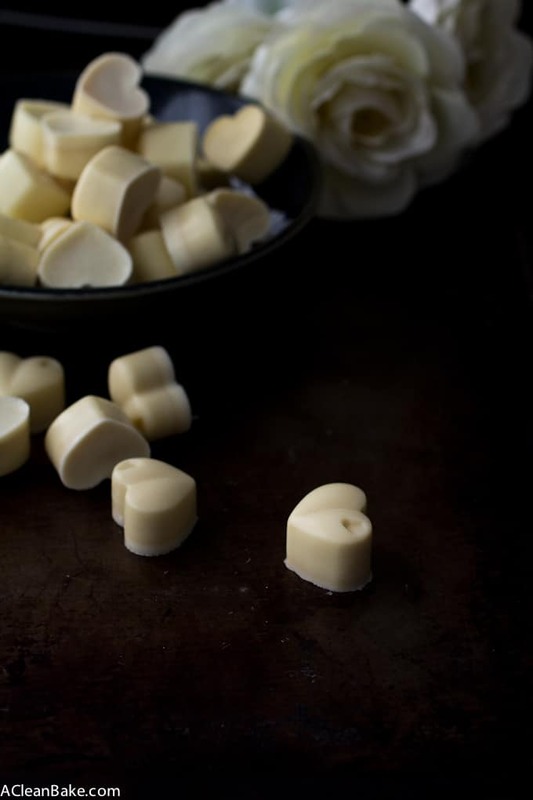 Look for as finely granulated a produce as you can find, and expect that there may be a little subtle grittiness to you chocolate if it doesn't melt completely (which some brands won't). It's not a deal breaker though - the chocolate will still be good either way! 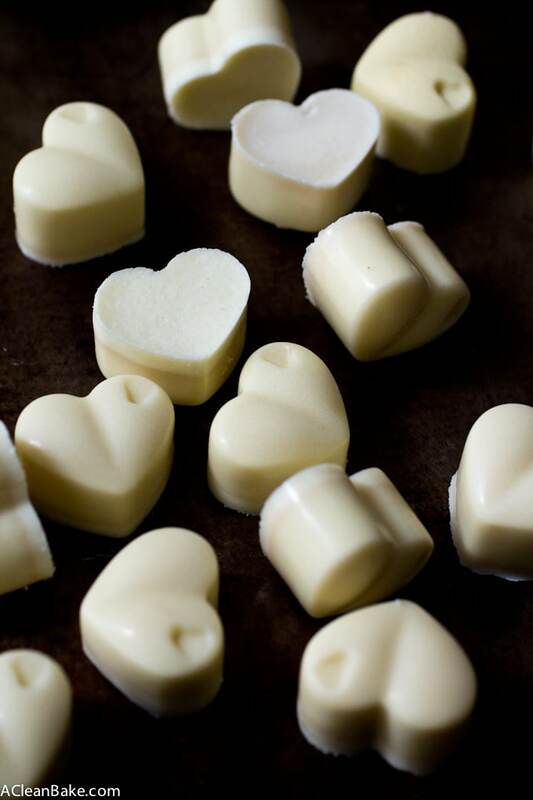 Before you put the chocolate into molds, taste it for sweetness. One of the things I hate about most commercial white chocolate is how sweet it is, so this is *not* very sweet by comparison. 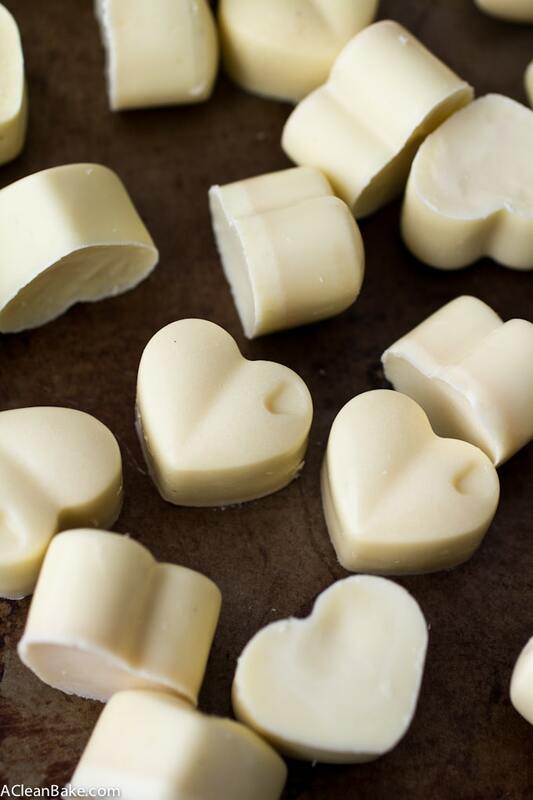 I used heart-shaped silicone chocolate molds, but if you prefer to make one larger bar, use this one instead. If you don't have chocolate molds, you can use mini loaf pans, but you need to lightly grease them first. To remove the chocolate, run a sharp knife around the edges to loosen, turn the loaf pan over and tap firmly on the base. The chocolate bar should pop right out. Because this chocolate is so pure, and contains no emulsifiers or gums to hold its shape, you have to freeze it before you bake with it. Take it out of the freezer immediately before folding it into the batter, then pop whatever you're baking in the oven immediately. Freezing it gives the chocolate a snowball's chance in hell (literally) of holding it's shape during the baking process, because it will take longer to heat up to its melting point (ideally, it will take longer to get to its melting point than it will be in the oven, preventing it from liquefying and absorbing into the batter). Replace the coconut oil in the recipe with cacao butter - so, use approximately 2/3 cup (1/3 cup + 2 oz) of cacao butter and no oil This is the cacao butter I use and recommend. Instead of putting the chocolate into molds to set, spread it in a thick layer on a baking sheet lined with a silicone baking mat. If you don't have that, use parchment paper. Once the chocolate is fully set, chop it into chunks. When you're chopping the chocolate, make the chunks bigger than you'd like them to be in the cookies. Since your chunks won't have any stabilizers in them like commercial chocolate chips or chunks do, there is some melting during baking. I usually make my chunks about 30% (that is not a scientific number, just an estimate!) larger than I want them to be in the finished cookie to account for the mass lost to melting during baking. This is awesome! I love white chocolate, but not the sugar coma it gives me. I need to try this. Same here! If you try it, please let me know what you think! Yep! You can definitely use a dairy free milk powder and make this vegan! 1/4 tsp – 1/2 tsp to taste. Sorry – just corrected the recipe. Thanks for catching that! I can’t seem to find cocoa butter. The closest thing o found was cocoa+coconut butter. Is that alright? I’m sorry, no, that would produce a totally different result. Cocoa butter can be tough to track down, but you can always find it online. This is the one I used (which I got from Amazon): http://amzn.to/29TkWX9. Good luck! Are you talking about your cacao butter? I think you bought the wrong product. Could I use this for cake pops? Unless you are able to keep the cake pops refrigerated until you serve them, I wouldn’t recommend it. The problem is that there are no stabilizers in this chocolate to keep it solid at room temp, especially in the summertime. Sorry! Hello! How many ounces does this yield? I want to use it as a substitute for a recipe that calls for 8 oz of melted white chocolate chips. Thank you! Hi Ellen! I think it should yield about 4-5oz, but I’m not certain. Just to be safe, I’d recommend doubling the recipe, and then I think you should have enough! Could you make modeling chocolate with this? No, sorry. I wouldn’t risk it – it might melt! I have never tried it, but it’s worth a shot. I’d love to know how it goes if you try it! Hi…looks great. Thank You for sharing this. Do you think it might work for a white chocolate ganache to be poured over a pte-chilled layer cake or cheesecake? Hi Sharon! It’s hard to say whether this will work as a ganache. I’d actually recommend using this recipe instead, and simply using white chocolate instead of dark (and leave out the espresso powder). It’s not sugar free, but will behave more predictably for your cake! Hi Nora, thank you for sharing this recipe. I’m wondering, during your trials did you ever happen to try using tapioca starch/flour in place of the milk powder? I think it might cause a “rubbery” texture if it gets too heated, but on the other hand, it might help hold the chocolate’s shape without refrigeration…? I’m experimenting with sugar-free, vegan “white chocolate” peppermint to dip my honey-candied citrus fruit rinds into that won’t require refrigeration (at least in conditions below 80• F). I might try your recipe and just “powder” the chocolate with tapioca flour. Still experimenting here! Hi Terry! I didn’t try tapioca but I would NOT recommend it. You need the milk powder for the creaminess of the chocolate, and the texture and flavor of the tapioca would not work. However, if you want it to be dairy free, you can try using coconut milk powder. I have not tried it (fair warning!) but it would be a better bet than tapioca. Good luck! Hi Nora, I know I’m a little late to the party but I was just wondering what you would recommend for sweetener between monk fruit extract (powder), granulated coconut sugar, maple syrup or organic powdered sugar? Not sure which of those would provide the right texture for this recipe. Thanks so much for this, have been looking for a white chocolate recipe for a long time & I’m looking forward to trying it! Hi Elle! Are you saying you’d like to replace the monk fruit? If so, I’d use organic powdered sugar if you can, since that’s going to provide the best texture. Coconut sugar is usually too coarsely ground. If you’re making a sauce, you could also try maple syrup (I usually don’t recommend it because the chocolate won’t set due to all the extra moisture, but since you want it to be liquid anyway, it may not matter.) Let me know what ends up working! 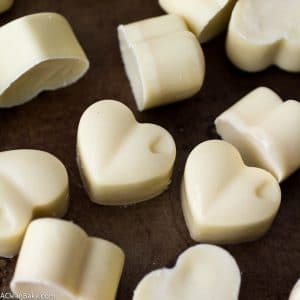 PS, I forgot to mention, I am trying to make a white chocolate flavored sauce for coffee recipes. Not sure if that changes things. I don’t need it to be stable for molds necessarily. Thanks! Fascinating recipe! 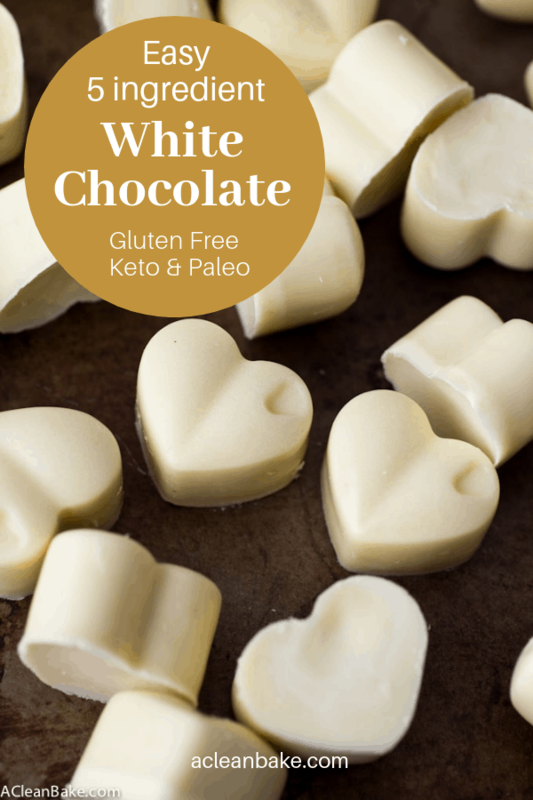 As a white chocolate lover, I’m intrigued! I just put this in the molds but it is quite gritty. Is that normal? You need to use very fine-grain stevia or monk fruit or else, yes, it will be gritty. Mine came out gritty . . .
Make sure you’re using powdered (or liquid) sweetener, not granulated. Hi Nora…. I am excited to try your recipe and wonder if you have ever used it to make white chocolate bark with nuts and dried fruit? I think it would be perfect with pecans, pumpkin seeds and dried cranberries for this Christmas. Thank you. I have not tried it! If you’d like to make this as the base for a bark, I’d recommend using cacao butter in place of the coconut oil, in addition to the cacao butter called for in the recipe. That will help it stay more solid at room temperature. Let me know how it turns out! Hi. I made this and its separating is that normal? Probably not lol. I put it in the fridge enow its separating. Hmm no that’s definitely not normal!